The NHL trade deadline is a mere two weeks away. Rumors of what players could end up where are rampant throughout professional and amateur hockey media outlets. One storyline that has continued to ring through the talking points has been the Pittsburgh Penguins situation in regards to a third line center. That story has taken a bit of a twist. Current 3C, Riley Sheahan, has remembered how to play hockey. Good hockey at that. Yes, the former Detroit Red Wing who went 81 games without a goal. That Riley Sheahan. Since the calendar turned to 2018, Sheahan has played some of the best hockey of his career and has found new confidence at the third line center position. 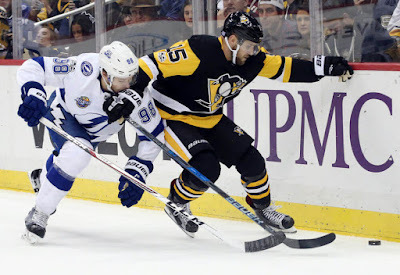 He has been generating a lot of scoring opportunities, winning face offs (55.3 FO%), and has been a great asset on the Penguins penalty kill unit that is currently fourth in the league. Want dangles- Sheahan has them for you? From the eye test, Sheahan has done everything any general manager and coach could want when it comes to being a fit at 3C. Over the last eight games, Sheahan has seven points. He can skate and has been flying up and down the ice in every situation. He is above average defensively and has noticeable in all three zones. He also seems to have found his hands and is currently on pace for 10 goals/ 26 assists for 36 points should he continue this rise in his game. Since 2018 began, Sheahan has been doing everything right, yet there is still this annoying little whine coming from the Penguins fan base. No- Sheahan is not Bonino. He is better. Still not convinced, then take these stats into account: Sheahan is at .59 points per game since Jan.1. Bonino averaged .46 points per game all season in 2015-16 and 2016-17. Sheahan also currently has a point on the power play and a point shorthanded. Bonino does not. Sheahan has 21 points in 48 games played. Bonino has 16. All in all, since the page turned on a new year, Riley Sheahan has been out performing Nick Bonino statistically in almost every way. There is no other way to put it. A love affair with a beard, a cool-sounding nickname and a (now legendary) goal call clouds the perception of a fan base that would rather hang on to the past rather than see what is in front of them in the present. The only thing Bonino possess over Sheahan is post-season experience. For Sheahan to finally put the doubters to rest, he is really going to have to bring his game to the highest level possible if/when the Penguins make the playoffs,. Unfortunately there isn't much of a sample to go off of to indicate if such a feat is possible. Sheahan has put the organization in a bit of a bind. He is making his case as to why he should remain at 3C and that the Penguins mindset should be filling gaps elsewhere in the line up. There is no telling what General Manager Jim Rutherford may do in the coming days leading up to the trade deadline, but Sheahan has definitely making any decision there could be a lot harder. well said and I completely agree. I would be fine if we stayed status quo and added a Letestu or Cullen, at a much cheaper cost, through a deadline deal to be the 4C upgrade who could slot up if need be. Unless you can grab a Brassard, Pageau, Plekanic, etc. at a super cheap price, there is no point in changing what has been working. Fun Fact- Pageau has worse stats than Sheahan and only 18 points. He is also a -5 so it would technically be a downgrade at this point.